Why would you need to look for foods high in Folic acid, now that it seems practically everything on the grocery shelves come fortified with the stuff? It is true cereal, bread, waffles, pasta, and countless imaginative breakfast foods add Folic acid, but it doesn't hurt to double-check that you do indeed meet your daily requirements. This is especially true if you're pregnant or soon-to-be pregnant. Folic acid is also known as vitamin B 9, a water-soluble vitamin heavily involved in the creation of new cells. For a pregnant woman, this is obviously of great importance since lack of Folic acid makes it harder for the fetus to develop properly and thus may cause severe birth defects. However, everyone has certain cellular "turnaround" where old cells die and new are created in their place; hence Folic acid is important to men and women, young and old alike. The RDI for Folic acid is 400 micrograms per day, except pregnant women who should aim for 600 micrograms per day. This isn't particularly difficult to accomplish if you just make sure to include one or two good sources of Folic acid per day. Breakfast cereals - Some brands really go all-out in the Folic acid enrichment department, particularly when it comes to bran flakes and other health-conscious varieties. You can find cereals with three or four times the amount needed with RDI in a single 100 gram serving. While Folic acid has very low toxicity and this probably isn't hurting anything short-term, making a habit of eating such large quantities of Folic acid can impair vitamin B 12 absorption. 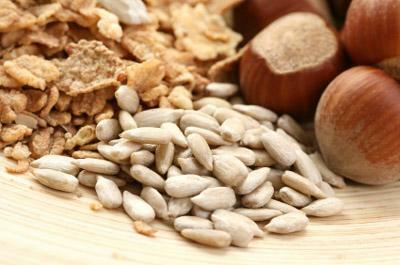 Sunflower seeds - Popular for snacking, they also pack quite a bit of Folic acid at about 300 mcg per cup. Blackeyed peas - Folic acid can vary a little, but they usually clock in at a respectable 200 mcg or so per cup. Spinach - Not only do you get humongous forearms and squinty eyes to the sound of catchy theme music when you chug a cup a spinach, but you also score about 200 mcg of Folic acid. Peanut butter - This popular staple of the American diet packs lot of protein and important nutrients. As a bonus, many brands enrich the stuff, making the final product a good source of Folic acid. Brands vary quite a bit so read the labels, but make sure to get unhydrogenated peanut butter (where you have to stir in the oil at the top) to keep your arteries from getting clogged with nasty trans fats. Beans - There are many varieties of beans; most contain decent amounts of Folic acid. White beans has about 150 mcg per cup, for example. Granola bars - While it may not seem like an obvious source of Folic acid, chances are your afternoon snack comes with a surprising amount of the stuff. Some brands have upwards 300-400 mcg per bar, which will pretty much cover your daily intake right then and there. Green vegetables - Spinach aside, most green, leafy veggies typically come with a decent dose of Folic acid. They're nowhere near the kind of concentration found in artificially enriched products like cereals and pasta, but the overall health benefits of a salad per day -- vitamins, fiber, trace minerals etc. -- makes this an attractive option for getting part of your Folic acid intake. Finding foods high in Folic acid is not difficult. All packaged foods are legally required to provide easy-to-read nutritional information, and you'll find that quite a few products play it very safe with more than 100 percent of RDI in a single serving. In other words, there's truly no reason to miss the mark, especially if you're a pregnant or have a chance of becoming pregnant.